Good Morning, this is Capital Essence’s Market Outlook (the technical analysis of financial markets) for Monday October 15, 2018. We’ve noted in the previous Market Outlook that: “market is extremely oversold following recent decline. Like a rubber band, stocks tend to snap back to the mean if they have dropped too far from the “fair” value. With that said, if lower stock prices create some values for investors, then, given everything being equal, the market should be able to find some buyers. However, give the significant damage that had been done over the past few days, we may need to see evidence of exhaustive selling to suggest that near-term risks are ebbing. S&P’s 2700 is the line in the sand. A close below that level could trigger a torrent of selling, which would eventually push the S&P down to the early 2018 lows.” As anticipated, stocks traded in a wide range Friday. The S&P gained as much as 65 points and briefly turned negative before rallying into the close. For the day, the bench mark gauge rose 1.4 percent to 2,767.13. The Dow Jones Industrial Average gained 1.15 percent to 25,339.99. The Nasdaq Composite outperformed, surging more than 2 percent to 7,496.89. The CBOE Volatility Index (VIX), widely considered the best gauge of fear in the market, fell more than 14 percent to 21.31. Technology shares, the best performers this year, dropped more than 3.5 percent last week. It was the sector’s worst week since March. The Technology Select Sector SPDR ETF (XLK) fell 3.8 percent to 70.83 on the week but is up more than 10% YTD, outperformed the S&P by a wide margin. Now the question is whether recent pullback is a pause that refreshes or it’s a beginning of something worse? Below is an update look at a trade in XLK. Our “U.S. 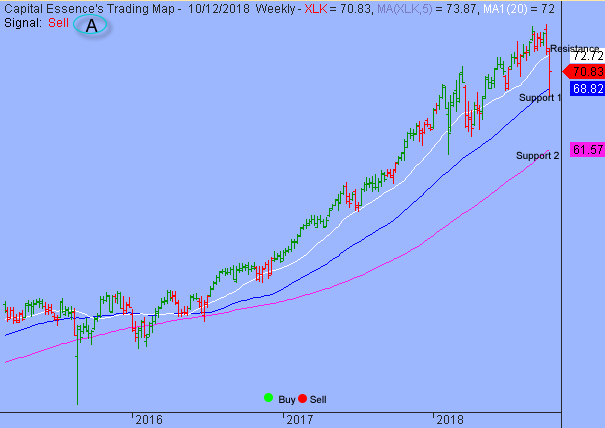 Market Trading Map” painted XLK bars in red (sell) – see area ‘A’ in the chart. Over the past few weeks, XLK has been trending lower in a short-term corrective mode after the April rally stalled near 76. Last week’s selloff pushed the ETF down to the 1-year moving average. This level has been tested several times over the past years. Friday’s intraday reversal suggested that the support would hold but evidence of near-term capitulation is needed before we can conclude that we’re out of the woods. XLK has support just below 69. A close below that level on a weekly basis has measured move to around 61.50, based on the 2-year moving average. Short-term technical outlook shifted to slightly bearish. Last changed October 12, 2018 from bearish (see area ‘A’ in the chart). 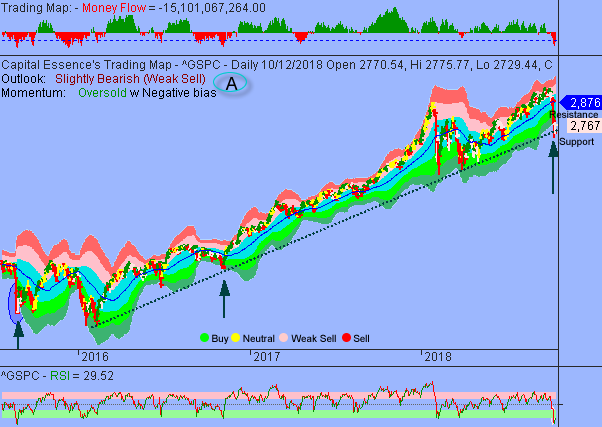 As expected, S&P bounced off support at the 2016 rising trend line, the level that offered support since the index reached an interim low in 2016. Momentum indicator shifted higher from oversold zone, allowing additional upside probing. Nevertheless, Money Flow measure is sitting at the lowest level since early 2017, indicating a negative net demand for stocks. This is a bearish development, suggesting that the index might have to go to much lower level to attract new buyers as soon as it works off excessive pessimism. If the market is going to find a bottom in the near term, we want to see the S&P stabilizes and closes above the bottom of its short-term trading range, around 2800. In summary, so far the oversold bounce has proved nothing as far as its staying power or as a possible trend reversal. While there is a high probability that the late-day rally will momentum but a close above S&P’s 2800 is needed before there is any real prospect of a change in the short-term downward trend pressure. 2700 is the line in the sand. A close below that level on a weekly basis will break the multi-year uptrend and increases the probability of a full-blow correction.